Driftsun is one of the brands that upgraded their manufacturing game significantly to make sure it’s head to head with many other global names. 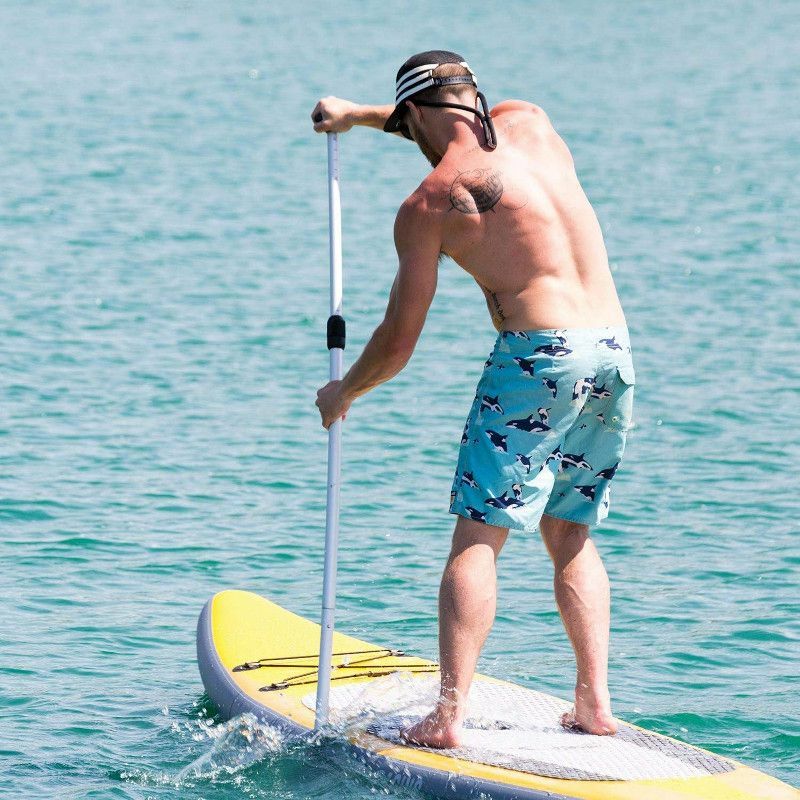 With a variety of products that include ice chests, kayaks, chairs and hammocks, Driftsun made it a priority to make countless quality inflatable stand up paddle boards for every water activity leaving water enthusiasts in complete satisfaction. Here today, we’re reviewing one of Driftsun’s coolest iSUPs; the Driftsun 11’8″ Racing/Touring SUP that’s promised to be durable and versatile. As usual, we’ll try to cover everything you need to know concerning the build quality, features and some of the best specs of this board, and we hope this review helps you in any way possible. 11'8" x 31" x 6"
Just like the name of the board suggests; this iSUP is 11.8 feet long which is perfect for touring. The Driftsun can easily be considered amongst the big guys as it can hold up to 300 lbs. it’s a large board that comfortably carry two adults for a nice recreational tour. Speaking width, this board is 31 inches wide and that’s my friend is something awesome. Racing paddle boards usually tend to be slimmer than that, but with this one you get to also tour, workout, and race in complete balance and stability thanks to its width dimension. And of course, what really adds up to any iSUP’s performance is the thickness factor. The Driftsun went for nothing but the best and gave their board a solid 6 inches here for maximum float which is much needed when the iSUP is loaded. 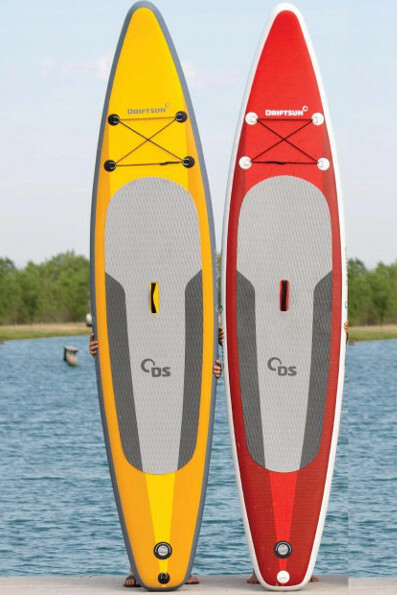 The Driftsun 11.8, like any other quality inflatable SUP, is built using 3 layers of heavy duty PVC material to make its outer body as stiff and strong as possible. This is the best choice for all inflatable products manufactures around the world because in this situation it guarantees that the board will maintain its shape every time you inflate it which directly affects the overall performance of the iSUP. Moreover, the high pressure Drop-Stitch technique used to put the board together with layers of urethane and polymer result in what we call an indestructible inflatable SUP. Now of course no iSUP ever is completely safe from getting punctured; however, an inflatable is a lot more flexible than any hard board. In other words, you can throw this board off a building, run a car over it or hit some beach rocks and you’d still have it scratch free. 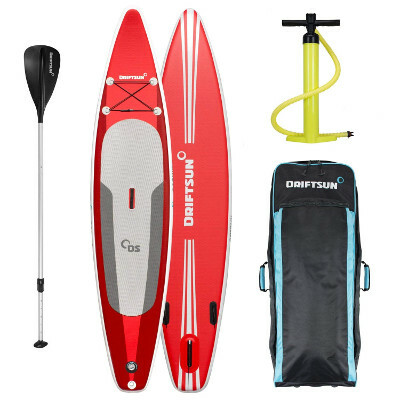 The Driftsun 11.8 is another fully equipped iSUP that we’re glad to be featuring on our website because we didn’t hear of it disappointing anyone who ordered it. First things first, this iSUP comes in two color options; red/gray and yellow/gray. Both are equally nice though I’m personally leaning towards preferring the yellow one because I find it somehow sharper and more attractive. Now this board as we previously mentioned comes with every feature known to iSUPs, and the most infamous one is the traction pad. The Driftsun’s pad is diamond grooved and it covers half its back on the center. It’s soft and grippy exactly as it should be. There is also the central carry handle that’ll help even the smallest of the riders carry the inflated board around single handed with minimum effort. In addition to that, there is a small storage area on the board’s deck with 4 D-rings and a bungee cord. It works very nicely when needed either to secure your paddle or to attach some extra cargo. There another D-ring on the board’s tail for safety purposes when a leash is required. And finally, the navigation system on the Driftsun 11.8 is a great one with 3 rigid fins; one of which is large, central and removable while the other 2 are lateral and fixed. A great quality carry backpack with rolling wheels for a better travelling and transporting experience. An adjustable 3-piece aluminum paddle. It’s literally everything an iSUP needs to be perfect and complete. Given the Driftsun’s great dimensions; it’s hard to expect anything but good and strong performance from it. This board is super stable in both flat water and the waves thanks to its remarkable width. Anyone riding it will experience a great deal of support and balance regardless of his/her skill level. 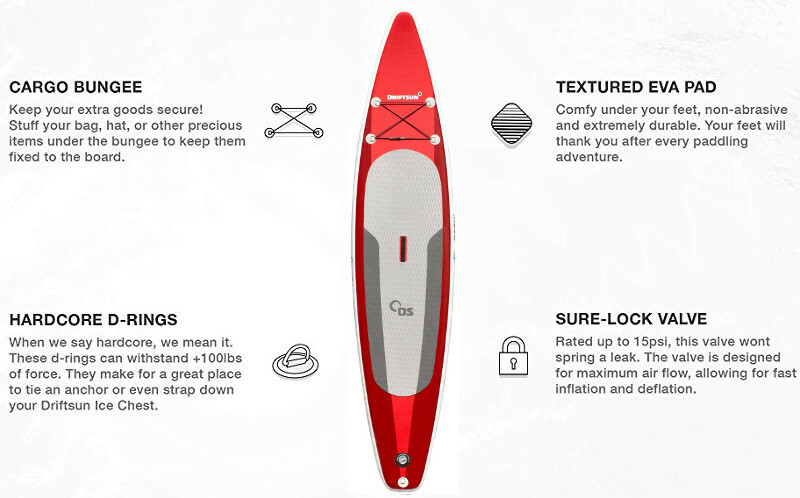 However, this board is designed for intermediate and experienced paddlers who can take over rivers and long distance touring swiftly and safely. The Driftsun’s pointy nose makes cutting through the water feel like cutting a cake; it glides very smoothly and it’s quite responsive to whatever effort you put into paddling. In terms of speed, this is definitely not a slow iSUP. Racing and speed touring are your first choices with the Driftsun 11.8. Plus, the navigation system makes it a lot smoother and easier to keep a straight line while giving it your all for maximum speed which makes a lot easier. The Driftsun 11.8 comes in an all inclusive package. It comes with a great wheeled travel backpack where you can fit the whole thing. It’s 31 inches wide and 6 inches thick for maximum float and stability. It’s a fast racing/touring iSUP thanks to its body design and built material. It can hold up to 300 lbs. None that we can think of at the moment.